While most may strive for a uplifting and bouncy start to their weekend, sometimes metal fans want nothing more than to check out a heavy, dark, and monstrous slab of doom to start things off right. If you belong to that camp, you’ll be pleased to check out our song stream of Illimitable Dolor’s “Rail of Moon, A Stone.” Coming off of their self-titled album, due out through Transcending Obscurity Records on March 22, the track is the lead off of four soul-crushing and lengthy platters. If you like what you hear, you can still pre-order the album HERE or through the Bandcamp widget at the bottom of the page (order the CD version and you can snag a badge to accompany it). Of the track itself, “Rail of Moon, A Stone” takes the strongest elements of ’90s funeral doom and pulls it into an emotive experience. The dark and brooding lumbering at the onset of the track never really accelerates but still draws in the listener due to it’s sheer level of sorrow. The plodding riffs, low growls, and subtle backing keys craft themselves into something that builds into something special by the end of the last two minutes. Utterly depressive, but the type you can find solace in – it’s all wrapped into a beautifully dark finish. From members of the acclaimed doom band THE SLOW DEATH comes a special band paying tribute to their deceased band member, Gregg Williamson. Under the name of ILLIMITABLE DOLOR, they play some of the most emotive and sincere doom ever recorded. 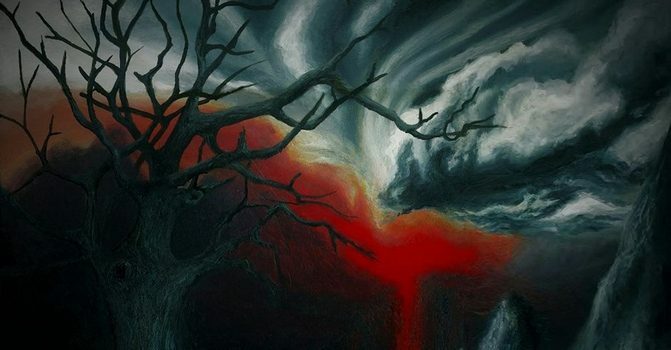 Extremely heartfelt and personal, these four songs are the perfect expression of grief-ridden, wistful and stirring doom that is reminiscent of the ’90s bands but add their own atmosphere to the output. Stuart Prickett writes some of the most heartrending music here and it’s easily palpable to any living soul. ILLIMITABLE DOLOR’s intent is pure as their music, deep and moving, and this debut full length is a testament to the power of raw emotions channelled gracefully as an ode to someone personal and cherished.